As a world renowned work of architecture and human civilization, the Great Wall is a must-see for anyone visiting China. Of course, considering the sheer length of the wall, which runs more than 21,000 kilometers along the northern part of the country, it is practically impossible to see it in its entirety. For this reason some better-preserved sections of the wall have become more popular than others over the years. Mutianyu is one of the most visited sections of the Great Wall. It is located in Beijing's Huairou district about 73 kilometers north of downtown Beijing. 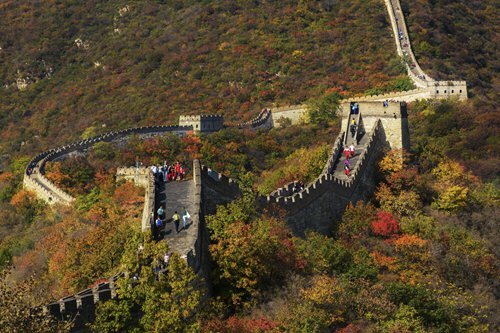 Around 5,400 meters in length, it is also the longest remaining section of the Great Wall. A quintuple-A national-level tourist area, Mutianyu is also one of the top 16 most famous tourist sites in and around Beijing. Though not as famous as the Badaling section of the Great Wall, Mutianyu presents a different view as it extends along mountains and is surrounded by swaths of greenery, which leads to many different looks throughout the four seasons of a year. Historical records show this section of the Great Wall was first built during the Northern Qi (550-577) and was restored several times during the Ming Dynasty (1368-1644). The latest construction on the wall took place in 1569. Built mainly using granite, the walls of this section range from seven to eight meters in height and about four to five meters in width. Most of the walls were built along cliffs, so the fortification could better defend against enemies. The watchtowers built along this section are one of the most notable buildings as their designs are distinctive compared to other sections of the Great Wall. Along the 2.25-kilometer section now made open to the public, one can trek through 20 of the watchtowers. The Ming Dynasty spent considerable time and resources on constructing or repairing the Mutianyu section for its geographic location made it extremely important for the safety of Beijing: The Mutianyu Pass was the part of the Great Wall that defended the capital and the imperial mausoleum's from invaders. As a symbol of Chinese culture and history, the Great Wall has become a must-see item on the itinerary of foreign guests who visit China. 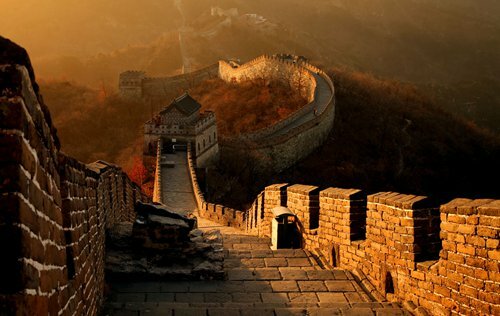 Among all the Great Wall sections, the Badaling section is the most well-known and visited. Many former US presidents including Richard Nixon, Ronald Reagan and Barack Obama visited the Badaling section. While the Mutianyu section may not be as famous, its exceptional charm and beauty has attracted a host of foreign leaders and their families. In 2014, US First Lady Michelle Obama visited the Mutianyu section of the Great Wall along with her mother and daughters when they came to China at the invitation of China's First Lady Peng Liyuan. Moreover, when US President Bill Clinton visited China in 1998, the Mutianyu section of the Great Wall was also included on the president's itinerary. After a packed schedule of visiting the Palace Museum on the morning of June 28, Clinton and his family "went directly to the Mutuianyu section of the Great Wall in the afternoon without having lunch," wrote a People's Daily article. In 1991, British Prime Minister John Major also visited the Mutianyu section. The cable car that he took that day remains in operation and carries a sign to commemorate the visit.